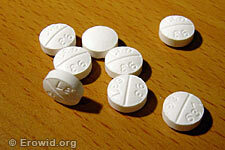 Trazodone is a serotonin modulator used in the treatment of depression. It is also prescribed for the treatment of insomnia, post-traumatic stress disorder, aggressive behavior and cocaine withdrawal. It acts both through serotonin receptor antagonism and re-uptake blockade (Rotzinger 1998).